↑ 3.0 3.1 3.2 Philpott 2009, pp. 602–603. ↑ 5.0 5.1 Harris 2008, p. 271. ↑ Frum, David (July 1, 2016). "The Lessons of the Somme". The Atlantic. Histories of Two Hundred and Fifty-One Divisions of the German Army which Participated in the War (1914–1918) (PDF). Washington: United States Army, American Expeditionary Forces, Intelligence Section. 1920. ISBN 5-87296-917-1. สืบค้นเมื่อ 13 September 2013. James, E. A. (1924). A Record of the Battles and Engagements of the British Armies in France and Flanders 1914–1918 (London Stamp Exchange 1990 ed.). Aldershot: Gale & Polden. ISBN 0-948130-18-0. OCLC 250857010. Jones, H. A. (1928). The War in the Air, Being the Story of the Part Played in the Great War by the Royal Air Force (PDF). II (N & M Press 2002 ed.). London: Clarendon Press. ISBN 1-84342-413-4. สืบค้นเมื่อ 9 August 2014. Masefield, J. (1917). The Old Front Line (PDF). New York City: Macmillan. OCLC 1183536. สืบค้นเมื่อ 27 June 2013. Mitchell, S. B. T. (2013). An Inter-Disciplinary Study of Learning in the 32nd Division on the Western Front, 1916–1918 (pdf) (PhD). University of Birmingham. OCLC 894593861. สืบค้นเมื่อ 1 December 2014. Nicholson, G. W. L. (1962). Canadian Expeditionary Force 1914–1919 (PDF). Official History of the Canadian Army in the First World War. Ottawa: Queen's Printer and Controller of Stationary. OCLC 557523890. สืบค้นเมื่อ 27 December 2012. Nomenclature Committee as Approved by Army Council (1922). Report of the Battles of the Somme (Cmnd 1138) (N & M Press 1994 ed.). London: HMSO. ISBN 1-84342-196-8. Robertshaw, A. (2006). 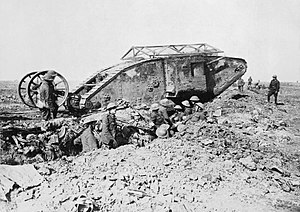 Somme 1 July 1916: Tragedy and Triumph. Oxford: Osprey Publishing. ISBN 1-84603-038-2. Statistics of the Military Effort of the British Empire During the Great War 1914–1920 (PDF) (1st ed.). London: HMSO. 1922. OCLC 1318955. สืบค้นเมื่อ 27 June 2013. หน้านี้แก้ไขล่าสุดเมื่อวันที่ 18 กุมภาพันธ์ 2562 เวลา 04:26 น.